The above verses and many other beautiful one from Hafiz, rendered by Daniel Ladinsky are featured in the documentary The 1 of Hearts: Ecstatic writers & Poet-Saints, is an hour long art/documentary that chronicles the comparative writings of the world's divine poets. Few weeks back I received this beautiful Art/Documentary DVD from it's Writer and Director Jan Bartelstone, and this is a work that captures tremendous beauty and mystery of the essential longing of the timeless Mystics and Saints of humanity across time and space. 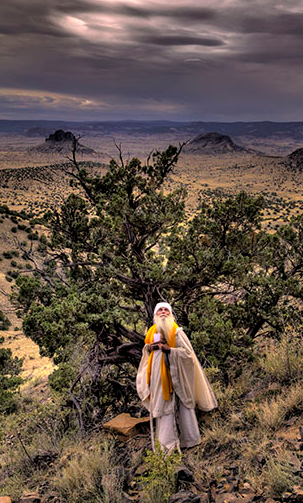 Beautifully filmed in some of New Mexico's most mystical areas, the poetry and narrative employ the sacred writings from mystical Hinduism, Buddhism, Sufism, Native America and Christianity and some lay poets as well. In the film three seekers individually set out on a metaphoric journey to realize their connection with their own divine nature. In the end, all paths, seekers and ecstatic writing lead to the same place. This film is a meditation on the path the soul takes to true recognition. I quote from the film, "For thousand of years the perfected spiritual masters from so many of the world's spiritual paths were saying the same thing. Occasionally they came in the form of poets. In the center of every human being is a golden ink-well of supreme knowledge where anyone can access that poetic remembrance of their own true nature. Some of the greatest mystical writers, Rama Krishna, Black Elk, Saint John of the Cross, Mira Bai or the incomparable Hafez, all from different cultures, backgrounds, sometimes spanning thousands of years apart from each other, in essence have the same experience. The 1 of Hearts traces the sacred, intoxicated writings from the mystical Hindu, Christian, Sufi, Native American and Buddhist traditions." Luminaries such as Krishna Das, internationally acclaimed chanter of the Divine Names and author, Richard Hooper, a brilliant spiritual scholar are interviewed. The incomparable Poet-Saint, Hafiz, is high-lighted from well-known author Daniel Ladinsky's highly successful book "The Gift". The narrative is punctuated by a haunting devotional sound track that blends sacred Hindu ragas with bluesy Middle Eastern vocals. New Mexico, where this documentary was filmed is highly regarded as a state with great mystical geography and the director chose three areas as a back drop for the journey of there unique seekers on a path back to what he calls the1ofHearts. This film invites you to sit, contemplate and eventually sink into sweet place of true, inner silence. Those who love mystical poetry and love those ecstatic and God intoxicated saints, for them this is a film not to miss. (+) Watch a Clip: You may watch a clip via Youtube for this film. Jan Bartelstone is the director and writer of the documentary. A long-time resident of New Mexico, he wrote and directed his first film in the 1980's for the NM Humanities Council. Twelve years ago, he became fascinated with spiritual writings and practices, dedicating a great deal of time to study and contemplation. Through his own journey he has found cogent similarities in the essential teachings of all the authentic paths. In 2010, he began producing his second film based on his study, personal experience and sharing 's encountered with many people seeking knowledge on spiritual levels. The result is an art documentary that chronicles the teachings of many "Poet-Saints" who translated their divine experiences in ecstatic verse from well before the time of Christianity to contemporary times. Director Jan Bartelston may be contacted via email at info@the1ofhearts.com. The film is available on both Blu ray and DVD. On the opening page a trailer also appears.